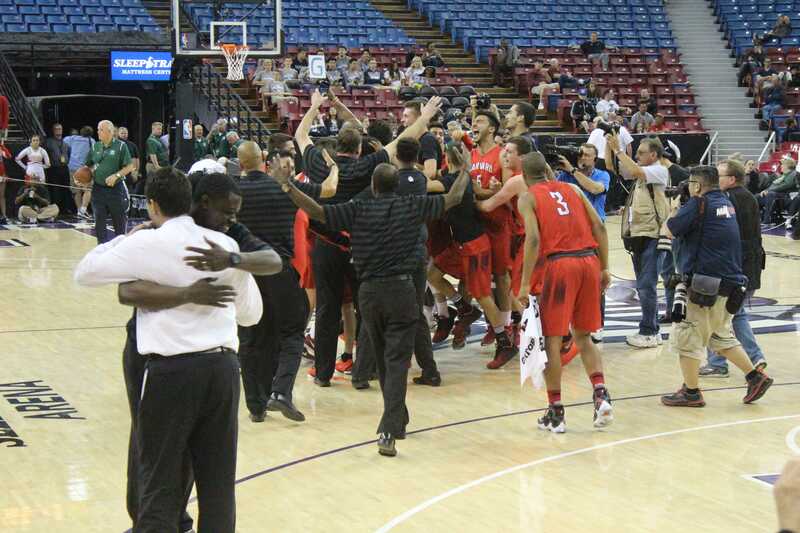 On March 26, 2016, the boys’ basketball team was leading Palma 66-49 in the state championship. From the bench and on the floor, the soon-to-be Californian champions looked up at the Sleep Train Arena scoreboard as the game’s last few seconds ticked off the clock. Freshman phenom Cassius Stanley waved his towel emphatically. Senior point guard Wolfgang Novogratz pointed up, his hand closing into a fist as the clock read 0:00. In many ways, that win was a remarkable achievement. Led by a first-year head coach, a high-flying freshman and a star point guard just a year removed from a leg injury, the Wolverines had risen into the top echelon of teams in the state of California. “It was nice to see it all come together and realize we’d been working towards a goal,” Iken said. It would only be another year before that team would come undone, and another would rise in its place. Stanley had arrived at Harvard-Westlake in June of 2015 with all the hype of a blue-chip recruit. After all, this was the rising freshman who’d replicated Vince Carter’s legendary “cookie jar” dunk, the very same one that Vinsanity used to seal the 2000 NBA Slam Dunk Contest. Before ever stepping foot on a high school court, Stanley already had an offer from USC. The excitement over the potential of the team’s new star grew to epic proportions. Fans flocked to Taper Gym to watch Stanley throw down his signature dunks night after night. It wasn’t all just social media hype and over-the-top fan reactions. Stanley was, without a doubt, exceptionally talented. He flashed his athletic ability and personal flair on the offensive end, but Rebibo expressed hopes for his development as a prospect. That summer, Novogratz graduated, but in came an even more talented freshman class: Johnny Juzang ’20, Mason Hooks ’20 and Terren Frank. Juzang is currently the 15th ranked prospect in the class of 2020 on ESPN’s online rankings. Hooks is a 6’10” paint-controlling behemoth who received an offer last month from Georgetown. Frank is now a starter on Sierra Canyon’s transfer-laden roster. Stanley went from sharing a backcourt with a talented senior guard to sharing a backcourt with another ESPN Top 25 prospect and a high-potential crop of fellow underclassmen. Tension within the team inhibited some of its early growth and led to a few losses at the outset of the season, Iken said. Stanley, meanwhile, started to become a problem for the Wolverines. On the court, his offensive production remained steady, as the sophomore drained 41 percent of his shots for 17.9 points per game. He added to his highlight tape every week with slam dunks and flashy layups. In other areas, however, the issues began to pile up. After an altercation during practice, Stanley walked out and left the gym early, multiple sources said. 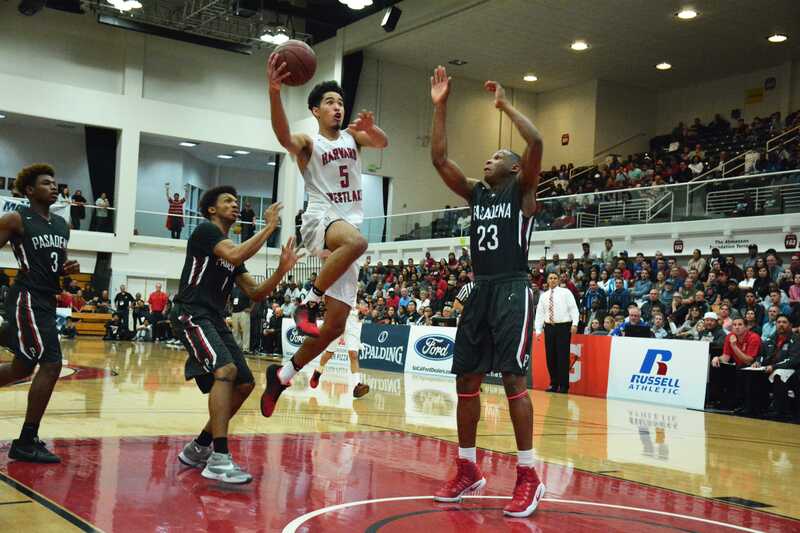 Stanley did not play in the following game against Alemany, a 74-52 Wolverine loss. Additionally, Stanley’s effort level during games sometimes seemed to sag, Rich said. These issues were particularly apparent on defense, the same area he’d been expected to improve in as a sophomore. That didn’t mesh well with the team-oriented and defensively-minded Rebibo. On June 7 of last year, Stanley made it official: he was done at Harvard-Westlake. The prodigal son was coming home to Sierra Canyon, where he’d join a projected starting lineup made up entirely of transfers. Following him to Sierra were L Simpson, a fellow rising junior, and the rising sophomore Frank. First it was Stanley, announcing his transfer through an Instagram video. Over the caption “new chapter @ballislife”, Stanley throws down a vicious dunk in Hamilton Gym. As he soars to the basket, the “SC” logo of Sierra Canyon fades onto the backboard. “After that Alemany thing I wasn’t really surprised to hear about Cassius transferring,” Wong said. Simpson’s post was more subdued, but no less impactful. A picture of himself and Stanley posing together on the upper school quad was accompanied by the caption “Gotta Blast.” Frank and Stanley were both tagged in the post, along with their soon-to-be teammate Kenyon Martin Jr.
David Sobel, an athletic director at Sierra Canyon, said that the team’s basketball staff and Stanley would not comment until their season ends. In a flash of social media and bruised egos, half of Harvard-Westlake basketball’s future walked out the door. Though, in retrospect, it didn’t cripple the Wolverines, or doom them to the kind of rebuilding season that losing nearly all of last season’s rotation players might’ve suggested. Freed from the shackles of a highly touted diva and the circus that he entailed, the Wolverines found success this season through a team-oriented approach. 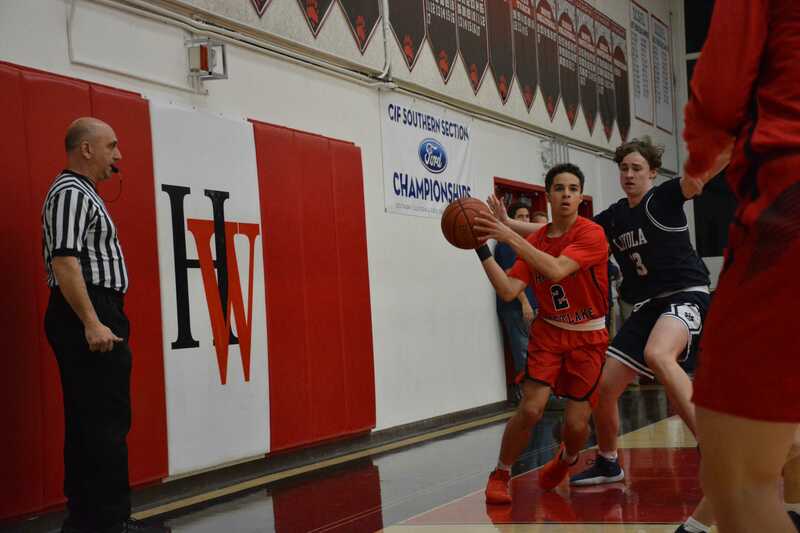 Eschewing the expected rebuilding process that accompanies playing four sophomores and a freshman in the starting lineup, the Wolverines dominated long stretches through the season, compiling a 22-6 record (9-3 in league play) and earning the second seed in a revamped Division I playoff. Hooks and Juzang produced at a much higher level than they did during their freshman seasons. Hooks in particular has seen his stats take a jump up across the board, shooting 61% from the field from his station in the low post. The sophomore forward and Juzang have led the way on offense, helping patch up Stanley’s offensive output with 15.5 and 19.0 points per game, respectively. 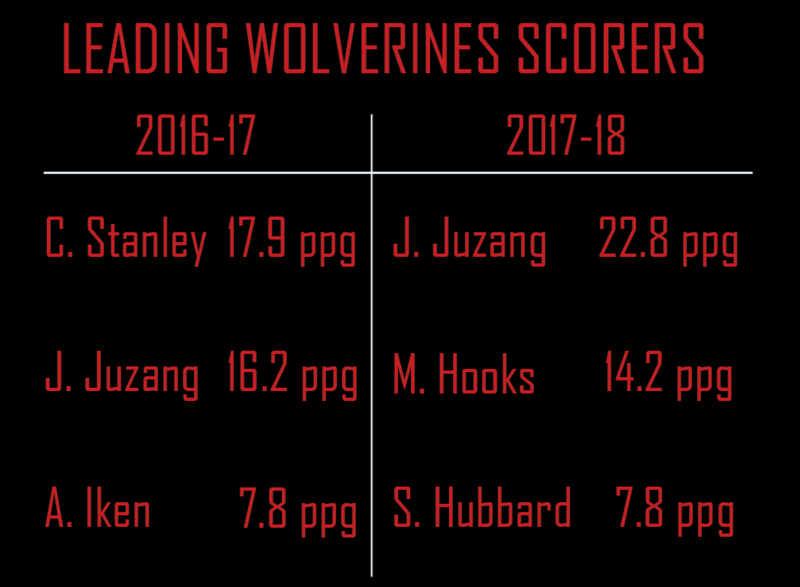 Team statistics would also seem to indicate an uptick in the Wolverines’ playing efficiency between last year and this one. Throughout the season, the team averaged a +4.86 scoring differential, nearly doubling last season’s +9.25. Though the Wolverines are averaging slightly more points per game this season than they did last season, this trend is mostly attributable to allowing less points on the defensive end. In addition to Hooks and Juzang, the Wolverines returned Simon Pompan ’18, the squad’s lone senior. Pompan started several key games for the Wolverines down the stretch, shooting 39% from three-point range. Hubbard, an undersized but crafty guard, started as the Wolverine point man, while football quarterback Jameson Wang ’20 emerged as a key contributor. Truman Gettings '21, a 6' 7" forward, started at forward opposite Hooks. In the early part of the season, the Wolverines looked poised to make a run at the Open Division to appearing on the CIF’s Open Division watchlist as late as the final poll release Feb. 5. Ultimately, however, the team was done in by untimely injuries and illness at the worst possible moments. 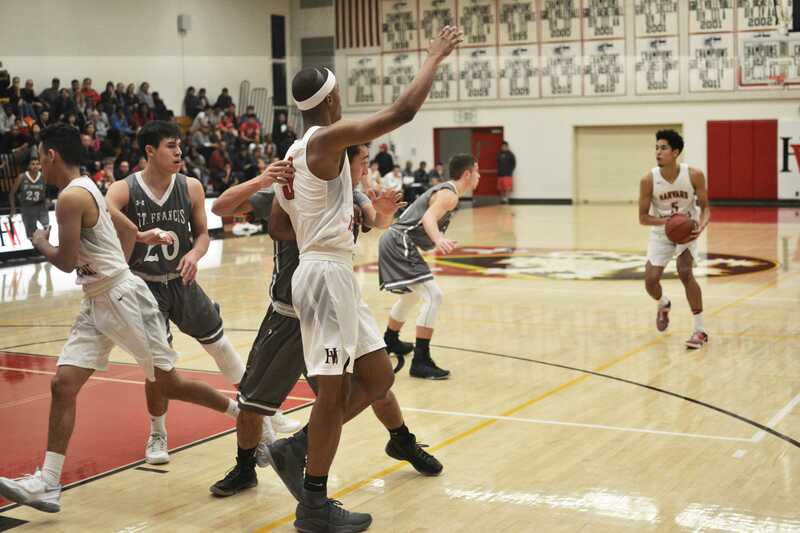 Brase Dottin ’20 missed several weeks with a concussion, including a critical loss to Crespi on Jan. 17. Both Dottin and Hooks (flu symptoms) missed the Wolverines’ Jan. 29 game against Alemany, a two-point Wolverines loss. 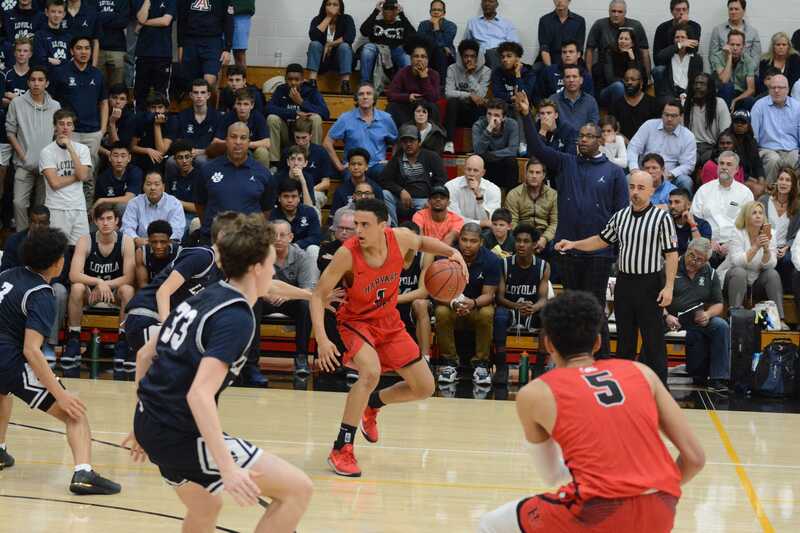 As a result of the Alemany loss, the Wolverines became the final team eliminated from league-title contention before their final game of the season against Crespi on Feb. 9. If the Wolverines had won either the Alemany or Crespi losses, they would have had a chance to win a share of the league title with a victory in the final game. Gettings missed that game entirely with a concussion, while Hooks only played a few minutes in his return from illness. “It was tough because the flu makes you so much weaker,” Hooks said. Despite an early Division I exit to Rancho Verde, the Wolverines will retain their entire roster except Pompan next season.